There’s a famous person in the house! When this wee camper van was blocking our drive this evening, I was a bit irritated, looked like possible hippies! Mark said it was an older person, when they finally moved and we could get into our house, he said I should go are they ok, I need to behave like a kiwi, not A pom! A wee lady was in the drivers seat of the van. She was alone. The camper looked well used, and in a little disarray. She sounded Scandinavian. I asked was she ok. She said the sun was too bright on the road and she couldn’t see, she was going to wait till it was gone. I looked down the road, then at my watch. Wall to wall blue skies and it was only 7pm. I advised her she might be waiting a while, perhaps she should go back and get a cuppa somewhere, as this road would be like this for the next 20km. She said she would do that, so I went back into the house. I was busy telling Mark about it, when he said ‘your friend just drove up. Go and invite her in’. I looked out and she was now parked at our back door, in her camper van. This was getting too weird. I went back out to her again. She seemed a bit confused, but harmless enough. So I asked did she want a cuppa. She told us her name was Ans Westra, she was from Holland and has lived here since the 50’s. She still very much had her Dutch accent. She said she was a photographer and had been exhibiting on Stewart Island for the past week. She was on a tour of South Island retracing places where she had visited to take photos before, to take more. She had her cuppa, the sun set and with the help of mark (to turn her van around) she was off on her way. after she left, Mark googled her. ‘Don’t tell me, she is some rich, famous person that I should have invited in for dinner and asked to stay the night, no?’ Not far off. Here is her New Zealand Arts council bio. Ans Westra is a self-taught New Zealand photographer, with an interest in Māori. Westra emigrated to New Zealand in 1957. In 1996 Ans Westra was awarded the inaugural Southland Art Foundation Artist in Residence award by Southland Art Foundation, Southern Institute of Technology, Southland Museum and Art Gallery and Creative New Zealand. 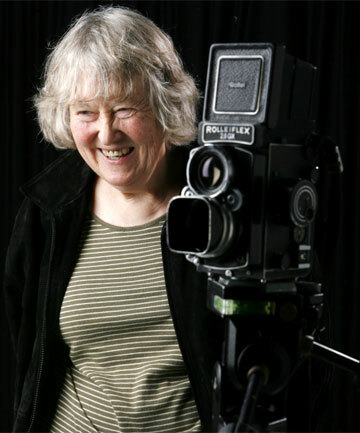 In 1998 Westra was awarded the Companion of the Order of New Zealand Merit for services to photography and in 2007 she became an Arts Foundation of New Zealand Icon artist. Westra was the subject of the 2006 documentary Ans Westra: Private Journeys/Public Thoughts by Luit Bieringa. Westra’s 2009 book and exhibition, The Crescent Moon: The Asian Face of Islam in New Zealand features her own photographs, with text by New Zealand writer Adrienne Jansen. The book’s interviews and photographs of thirty-seven individuals give insight into the lives of Asian Muslims in New Zealand. Washday at the pa, the book that she rose to fame with, was reissued in 2011 by Suite Publishing to include other photos of the same family taken in 1998. In February 2013 Ans Westra began her Full Circle Tour to revisit centers where she has been particularly active during her career. To date she has visited Ruatoria, Ruatoki, Rotorua, the Whanganui River and Kaitaia. Her next stop will be Invercargill in April 2014. This, I guess, is where she is right now. She said she was revisiting places, now I understand. Well I never. That’s the most peculiar thing that has happened to me in quite a while! This entry was posted in Invercargill and tagged Ans Westra, Invercargill, Photography. Bookmark the permalink.